A dramatic, nonfiction narrative about all biblical prophecies that portray the second coming of Christ and all events thereafter. No detail is left behind. Thousands of verses are joined together in a chronological framework and written about in a journalistic style in the present tense. STILL HERE is a “Nonfiction Alternative to Left Behind Theology.” Warrior From Heaven is Book 2 in the STILL HERE series. Published by BookPros in 2009, it is soft cover and 242 pages in length. It is a dramatic, nonfiction narrative about all biblical prophecies that portray the second coming of Christ and all events thereafter. No detail is left behind. Thousands of verses are joined together in a chronological framework and written about in a journalistic style in the present tense. This action-packed, biblical epic is quite engaging, easy reading, and written for the general public. About 15% of it is poetry, half of it from the Bible. The book begins with the military forces and heads of state of all of the world’s nations gathering into northern Israel. Then the Antichrist leads them to annihilate all Israeli Jews and wipe the State of Israel off the map. But a most significant Jewish remnant gathers at the temple in Jerusalem and repents of its sins. Then Jesus comes from heaven to earth as a warrior-king to lead these Jews in destroying all of these enemies. Finally, Jesus establishes his worldwide kingdom of peace centered at Jerusalem, with Israel as chief of the nations. Alas, here is the kind of Messiah the Jews were looking for when they rejected Jesus. To enhance readability, thousands of Scripture references are placed in the book’s margins alongside their corresponding lines in the text, as in some study reference Bibles. Also, there are six maps, few notes, and many text boxes which explain issues in the narrative. This unique book has been in progress for 35 years. It represents a lifetime of devoted study of Bible prophecy. 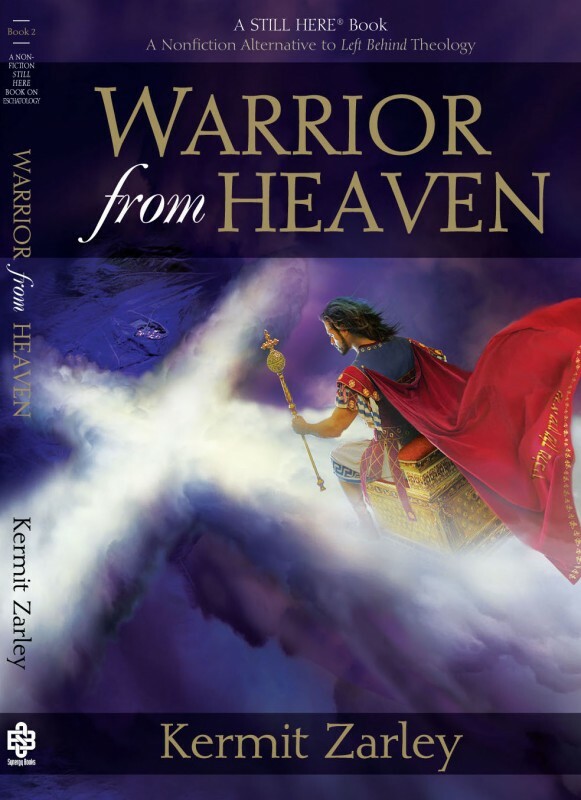 Warrior from Heaven may be the most sophisticated, chronologically-arranged narrative of biblical end-times prophecies ever published. Plus, an illustrator was hired to produce the striking image on this book’s front cover. This illustration portrays the biblical image of Jesus’ second coming, riding on clouds. Jesus is commonly depicted as a bastion of peace, but in the second coming, could he be riding out for war? “Warrior from Heaven” discusses the idea of Christ as liberator in the eventual rapture to stand against the Antichrist. Spinning this theory into an entertaining tale, “Warrior From Heaven” is of strong interest to any Christian wondering about the rapture and what Christ’s return will be like. Kermit Zarley, within the confines of his 219 page text, is a highly savant author and writer. His book represents tremendous research bringing with it a plethora of fullness that at times requires the reader to reread a certain section so as to gain the full representation of biblical history and/or futuristic world events yet to unfold. Karley’s narrative is not an easy read as it reminds me of required study material associated with college students striving to earn a degree in Theology or Bibical History. However, its material is wonderfully presented in a way that prods you to move forward so as to know more of this wonderous person called the God of all. I would highly recommend “Warrior from Heaven” for those who desire a non feckless advaned study and interpretation of the Holy Bible as it pertains to the past as well as the oncoming end times.